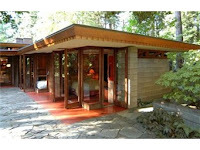 Most of us in Washington have probably never seen one of Frank Lloyd Wright’s architectural creations. That’s probably due to the fact that there only three of them in the state, all located in the Puget Sound Area. The majority remain in the Midwest, on the east coast, and a random selection of other states, including California. The Seattle Times had an article over the weekend about some of Wright’s most unique creations, the textile-block home. Wright created only 4 of this style, all of which are located in Southern California. Two of these, are currently on the market and realtors are finding that these masterpieces are hard to sell, which is surprising to most. Although the homes have a variety of issues, most notoriously the “leaking ceiling”, the historic and literally, one-of-four-of-a-kind homes, should be seeing more activity. The homes were built quickly between 1923 and 1925, and are seen, at least among the architectural community, as “one of Wright’s biggest accomplishments.” Just as incredible, although not quite as rare, are the “Usonian” style homes, which Wright created nearly 60 of. These homes are smaller, single-story homes known for having little storage space, let alone a garage. One of these homes, which includes heated floors and visually comparable interior and exterior features, is located in Sammamish, Washington. Known as the Brandes House, the Sammamish home was originally owned by Ray and Mimi Brandes who personally wrote to Wright asking him to build them a home. The home was finished in 1951. Fast forward 57 years to 2008, the year that Ewing and Clark real estate agents Jane Powers and Betsy Terry had the honor of selling the Sammamish home. Owning a Wright home is truly a once-in-a-lifetime opportunity. Despite the economy, thoughts are that the Wright homes for sale in California should be selling. Our thoughts are, buy the "Wright" house while you can! Seattle's Christ Our Hope Catholic Church had this first Sunday Mass this past weekend. The newly consecrated church is located in The Josephinum building at the corner of Second and Stewart. With 50,000 people living in Downtown Seattle, the Archbishop determined it was time to open a church in the low-income apartment building that has been owned by the Archdiocese since the 1960's. The church hopes to be able to server the community - whether condo owners, business people who work in the area, the people of the street, or tourist visiting from cruise ships. To learn more, you ran read the parish's website. Broadmoor is one of Seattle’s most exclusive residential communities, neighboring the beautiful Madison Park area and consisting of picturesque homes and a 115 acre golf fairway. The privacy of this gated community makes for unmatched serenity and the perfect place to make your next home. Ewing & Clark real estate agents Betsy Terry and Jane Powers have the honor of listing one of Broadmoor’s finest homes. The Broadmoor home, located at 3414 E. Shore Drive, is perfectly located between the golf fairway and a private street in the northeast corner of Broadmoor. 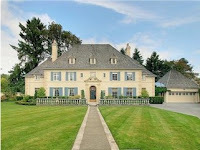 The landmark French inspired estate offers elegant styling, gracious rooms and floor to ceiling windows. The 1926 built home is fully updated and boasts a new and extravagant swimming pool terrace with hot tub and outdoor kitchen. For more information on this home or other homes for sale in or around the Broadmoor community, please contact a Ewing & Clark real estate agent today. The Downtown Seattle condo Olive 8 will soon be joining the auction trend. Come September 19, some of the luxury condos of the high-rise building will be up for auction by the real estate auction company, Kennedy Wilson. Condominiums up for auction include 1-2 bedroom units up to 1,586 sf. The bidding will start at $160,000, which is pretty nice considering condos were originally priced at the lowest of about $400,000. Still deal seekers should also consider buying through a real estate agent / Realtor outside the auction. As noted in a previous blog written by Nate Pearson, there are limits to real estate auctions. The main limitation to a real estate auction is the only variable is price, while when you make an offer through a real estate agent / realtor you can ask for other considerations such as build-outs etc. Read Nate’s blog for more details. But no matter what you do, Olive 8 is a building to seriously consider if you are looking for a downtown condo for sale. 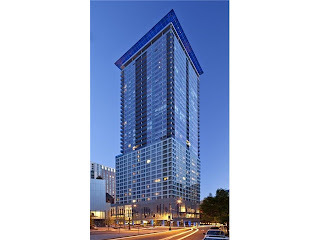 The accolades over the Olive 8 condominiums have not ceased since it’s opening in 2009. The building is LEED certified (Leadership in Energy and Environmental Design) and is the first Seattle condominium building to receive a silver certification, allowing you to own a green condo in the heart of downtown Seattle. The lowest level home is 18 stories up, as the 17 stories below are occupied by the Hyatt Hotel, providing some of the best views that a Seattle condo offers. Views include those of many Seattle neighborhoods view of the Puget Sound, Lake Union, and Lake Washington waterfronts. In addition, the luxury interiors include hard-wood flooring, Italian cabinetry, stainless steel appliances, unmatched fixtures, and the floor-to-ceiling windows. Moreover, these Seattle condominiums offer residents’ exclusive amenities and along with shared access to hotel amenities. These include, but are not limited to, a 24-hr concierge, a club lounge, entertainment room and dog run. Hotel amenities include room service and housekeeping, a fitness center and spa/Jacuzzi. This is accomplished with relatively low dues for a downtown condominium because the costs are shared with the hotel. Please contact Ewing and Clark for more information on condo purchases. 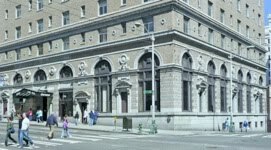 Congratulations to Sterling Savings Bank, Washington State's second largest bank, who raised $730 million from private equity which looks like will allow them to survive. Going forward the bank will concentrate more on consumer banking and lending to small and medium businesses and less on construction and real estate lending. To read more click here. 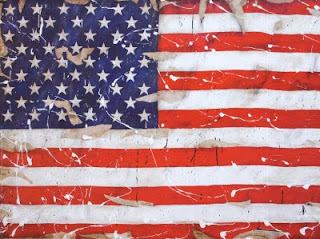 An article was recently published in Fortune magazine about home ownership and the link to the “American Dream”. Home ownership, which once went hand in hand with the concept of prosperity in America or the “American Dream”(since the mid 1800’s), has in recent years been breaking away from that association. What was once a signifier of success has unfortunately, as of late, lead to more problems than anything else it seems. And so begins the newest trend, referred to as the “rise of the renters”. It’s no secret that renting has (maybe not any longer) a stigma attached to it, but amid everything negative happening in the housing market, it actually seems to be becoming more appealing. Renting that is. Even the Obama administration has decided to shift their focus to rental housing as opposed to homeownership. Long gone are the days of negative references to the “renting class”. There are plenty of beautiful and high-end rentals that don’t quite reflect what that terminology once used to. Most rent property and choose not to own for the simple fact that they don’t have the financial means. In today’s economy, it’s no wonder the percentage of renters is on the rise. Our economy is facing high levels of unemployment and it’s reflecting in our financials. Renting has always been a much lighter burden on the wallet and that’s why the rental market is burgeoning. Renters don’t face any getting-harder-to-pay mortgages and property taxes and aren’t spending money on maintenance. Renting is becoming increasingly popular and people are, for the moment at least, putting their dream homes to the wayside. Should people think they’re not living the “dream” because of it though? According to most, no. It’s no longer about ownership anymore. It’s about living healthy, happy and working to improve your quality of life. So whether you choose to buy or rent, make the choice that is best for you. If you need to modify your dream, then do it. Making a substitution like renting instead of owning can be just as prosperous for some. According to the Seattle PI, the Seattle real estate market reflects that it is better to rent than buy. We are ranked #3 on a list of cities with the same outcome. In short, it’s simply cheaper given our current economical conditions and housing market. However in a previous Ewing and Clark blog by COO Casey Losh, after a number of internet calculators, his general outcome was the monthly costs of renting vs. owning were essentially the same, if appreciation/depreciation is not a contributing factor. Many say that NOW is the best time to buy. Because current mortgage rates are the lowest they’ve been in decades, this is a market where first time buyers will undoubtedly benefit. However, it is better to air on the side of caution. Renting is smart and affordable in today's economy, so don't let the issue of the "American Dream" stand in your way. Ewing and Clark title sponsor for Washington State Open Tennis Tournament. Today marks the first day of the 120th annual Washington State Open Tennis Tournament, hosted by the Seattle Tennis Club located at 922 McGilvra Blvd East in Madison Park. The week-long event’s title sponsors include Ewing and Clark, Inc., along with two other local businesses. The prestigious Seattle Tennis Club is expecting nearly 10,000 spectators to watch over 500 players compete. This event is free and open to the general public. Madison Park and the surrounding neighborhoods, Washington Park, Denny Blaine, and Broadmoor, feature premier Seattle real estate. To view Ewing & Clark's exclusive homes for sale in these areas, please click here.